The number of Oklahomans getting high-interest payday loans fell slightly in 2012, according to numbers recently released from the Oklahoma Department of Consumer Credit. 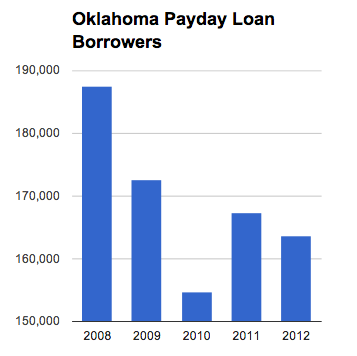 A total of 167,323 Oklahomans took out a payday loan in 2011, while in 2012 a total of 163,610 people took out payday loans – a decrease of around 2 percent, according to the department’s 2013 Deferred Deposit Lender Annual Report. The numbers show the average amount of payday loans increased in 2012, from around $397 in 2011 to around $409 in 2012. Payday loans are often single-repayment small loans with high interest rates and are made out of storefront businesses or online. Oklahomans take out payday loans at a higher rate than in any other state, according to a 2012 study by the Pew Charitable Trusts. The study also labeled Oklahoma state laws regulating payday loans as “permissive,” allowing for single-payment loans with annual percentage rates of 391 percent or higher. Most payday loan borrowers are white, female and between 25 and 44 years old, the Pew study states, and most borrowers use the loans to cover ordinary living expenses over months, rather than unexpected emergencies over weeks. Oklahoma payday lenders loaned $399 million to customers in 2012, down slightly from the $402 million loaned to customers in 2011, according to the Oklahoma Department of Consumer Credit report. The amount collected in finance charges remained relatively steady, at over $54 million. In both 2011 and 2012, payday loan customers averaged around six loans per year, according to the data. An interactive mapping of population percentages across Oklahoma.